a) �������; b) ������� � ����� ��������; c) �������; d) �������� ����; e) �����; f) ������� � ����� �����. ������������ Leptanillinae �������� ����� 50 ����������� ����� �� 5(7) ����� (ITISCA, Bolton, 1994, 1995). Leptanillinae ��� ���� �� ����� ����������, ��������� � ���������� � ���� ��������. ����������� � �������������� ������� ������� ������� (1-2 ��, Anomalomyrma �� 3-4 ��). ������������ ������� ���� �������� �������� ������� � 1923, ����� �� ������� ������� ������ �������� ����� Leptanillini Emery, 1910, �� ������ ���������� �� Dorylinae (� ������ �������� ��� ����� ���������� ����� �����) ���������������� ������������ Leptanillinae. ����� �������� ����� ������� ������ �� ������ � ������ � ������ ���� ����� ������� ������ � �������� (� 1995). Leptanillini Emery, 1910b: 32. ������� ���: Leptanilla. Leptanillinae ��� ���������: Bernard, 1951: 1053 [Leptanillidae]. Leptanillinae ��� ������������ of Formicidae: Wheeler, W.M. 1923f: 335; Wheeler, G.C. 1928: 89 (in text); Wheeler, G.C. & Wheeler, E.W. 1930: 199; Clark, 1951: 16; Brown, 1954e: 28; Petersen, 1968: 577; Wheeler, G.C. & Wheeler, J. 1972a: 37; Brown, 1973b: 166; all subsequent authors. Leptanillinae ��� ������������ leptanillomorph � ������� Formicidae: Bolton, 2003: 39, 151. Leptanillinae ��� ������������ incertae sedis � ������� Formicidae: Ward, 2007a: 555. ������������ ������� ���� �������� �������� ������� � 1923, ����� �� ������� ������� ������� �������� ����� Leptanillini Emery, 1910, �� ������ ���������� �� Dorylinae (� ������ �������� ��� ����� ���������� ����� ����� � 1910 ����) ���������������� ������������ Leptanillinae. ������ � ������� �������� ����, �.�. ������� �� ��� �����. ������� �������� ������ � ����� Anomalomyrma, Leptanilla, Protanilla, � ���� Noonilla, Phaulomyrma, Scyphodon, Yavnella �������� ������ �� ������. ������ � Anomalomyrma � Protanilla ����� ����������. ������� �������� �������������. Protanilla Taylor, 1990 - �����, �����, ��������, ������, ������. �����, Leptanillinae, ����� ��� ���������, ������ ��������������� � �������� ���������������� ������������ �������� � ������ ������� �������� ��� ����� �� ����� ����������� ����� ���� ��������. ������������ ���������� ��������� (Brown, 1954), �������������� � ������� Insectes Sociaux, ������������� �� � ������� �poneroid complex� (Cerapachyinae, Ponerinae, Myrmicinae, Dorylinae, Leptanillinae). �� �������������� ������ ������� (Bolton, 2003) �������� ������� ��������������� ����������������� ������ �������� "The Leptanillomorph Subfamilies" (Apomyrminae, Leptanillinae) (��������� �����). �� ������ (Moreau, 2006; Ward, 2007) ������������ Leptanillinae ���������� ��������������� ��������� ����� ������ � ������������ (formicoid clade) � ����������� (poneroid clade). ����� ���������� ���� �������� �� ������ ��� ������ ����������� ����������� � 140-168 ���.��� (�������� ������� �������), ����� ���������� ��������������� ����� � ����� ������������� Leptanillinae � �������� ����������� ������ �� ���� ������ ��������. �������������� ������� (��������� �� ����������� �������������� �������� �3 � �� ���������� �������� �4) ����� ������ ���������������� ��������, ��� ��� � Leptanillinae �����������, ��� �� ���������� �� ����� �������������� ������� �������� � Cerapachyinae, � ������� � ����� ���. �������������� ������� �������� � ���� ��������� Myrmicinae. ����� Ponerinae ��� ������� ������� � ������ Ponerini, Platythyreini, � � '������' Ectatommini, �� ����������� � Amblyoponini � � ��������� '������' Ectatommini. ��������������� ����� ����� ������ ������� Leptanillinae, �� ��� �� ������������ � �����������. ������ ��� ����������� ������������� ����� �������� � ������� � �������� ������� ����� � �������� ������������. ����� Aenictinae, Dorylinae, Ecitoninae � ���� Lepianilla, ������������ ����������� ����� � ��������� Leptogenys (Ponerinae) (e.g. Wilson, 1958: Bolton, 1975), � Onychomyrmex (Ponerinae) (Brown, I960), � Simopelta (Ponerinae) (Gotwald & Brown, 1967), � ��� ������� � ������ ���� ���� Sphinctomyrmex (Cerapachyinae) (Brown. 1975), ��� �������� �������� ��� ��������������. � ������� ����� ������ ������������, ����� ��� Apomyrma � Anomalomyrma, ������� ���������� �������� �����, ���� ��������� ������� ������������� ��������� 2 � 3 � Anomalomyrma ����� �������� � ������ ��� ������ ���� ����������� �������� �������������. Apomyrma. � ������� Leptanillinae � ��������� ����� Apomyrmini ������ ������������� ��� Apomyrma (Amblyoponinae, ����� Apomyrminae), �������� Bolton, 1990b: 280; Kugler, C. 1992: 106. ������������ ������������ Apomyrminae ������ �������� ������ Amblyoponinae (Saux et al. 2004). �������� �� �� ��������� ���� Apomyrma � ������ Amblyoponinae, �������� ��� ������������ �������������. 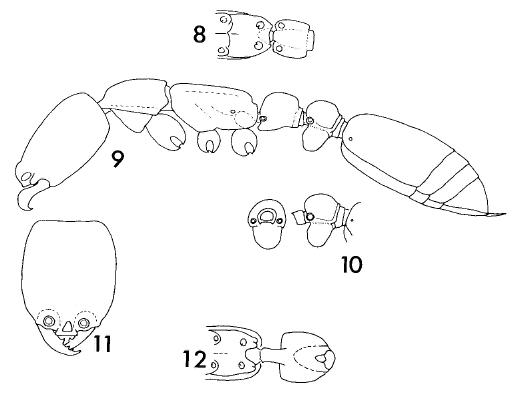 ��������� �������� � ��������� � ���������� Leptanillinae � Amblyoponinae (Brown et al. 1971, Bolton 1990, Masuko 1990, Ward 1994), ����� �������� � ���, ��� ������������ - ��� ������ ���������������� ������������. ������������ ������ �� ����� ���������� ���������� ��� �������� (Brady et al. 2006). 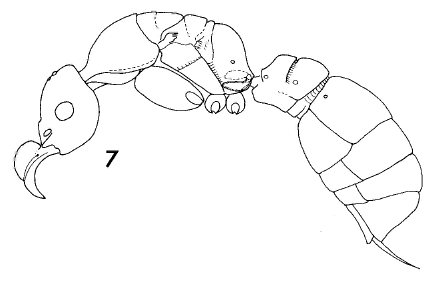 Apomyrma Brown, Gotwald & Levieux, 1971: 259. ������� ���: Apomyrma stygia, ������������ ���������. Apomyrma � ������� Ponerinae, Amblyoponini: Brown, Gotwald & Levieux, 1971: 273; Wheeler, G.C. & Wheeler, J. 1985: 256; Holldobler & Wilson, 1990: 10. Apomyrma � ������� Ponerinae, Apomyrmini: Dlussky & Fedoseeva, 1988: 78 (misspelled as Aromyrmini). 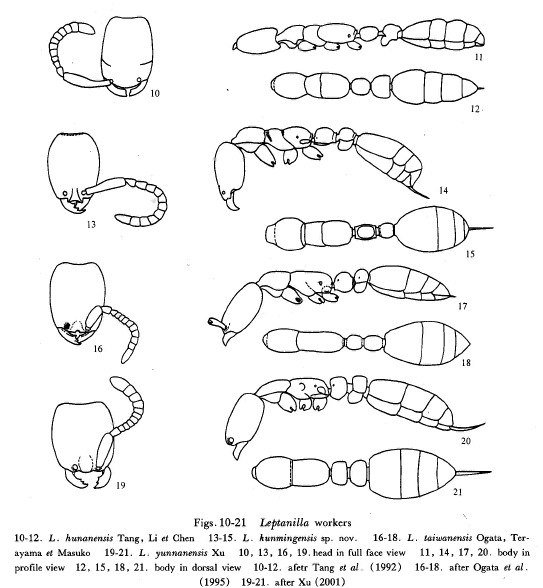 Apomyrma � ������� Leptanillinae, Apomyrmini: Bolton, 1990b: 280; Kugler, C. 1992: 106. Apomyrma � ������� Apomyrminae, Apomyrmini: Baroni Urbani, Bolton & Ward, 1992: 316; Bolton, 1994: 16; Bolton, 2003: 39. 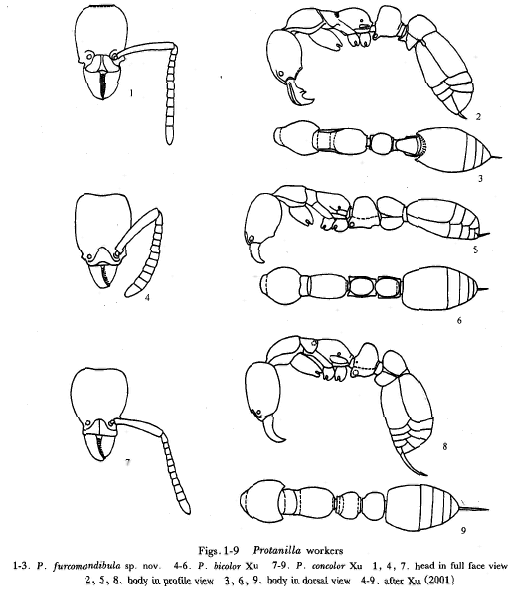 Apomyrma � ������� Amblyoponinae: Saux, Fisher & Spicer, 2004: 465. ����� ������ ���� ����� 2.5 �� � �����, ������� ������-������. � Leptanilla �������� ����� � ������ �� ������ �������, � � ������� �� 2-�. ����� � 1990 ���� �������� ������ � 6 ����� (4 �� ���� Leptanilla). ����� 20 �� 50 ����� ������� ������ �� ������. 3 Antennae with 12 segments (in all known species). 4 Promesonotal suture present and mobile, usually deeply constricted. 8 Propodeal spiracle circular and far back on side of sclerite, low on side (except in a few minute species of Leptanilla where the dorsum is very depressed). 9 Tergite and sternite of petiole fused, without trace of a suture; or sternite reduced to a vestigial sclerite posteromedially. 10 Helcium with sternite reduced, not visible in profile; sternite seen in frontal view as a transverse strip between the arms of the inverted U-shaped tergite; helcial tergite and sternite fused. 11 Spiracle of abdominal segment 3 large and far forward, very close to or even on anterior face of posttergite. 12 Abdominal segment 4 without tergosternal fusion, the posttergite broadly overlapping the poststernite laterally. 13 Stridulatory apparatus absent from posttergite of abdominal segment 3 and pretergite of segment 4 dorsally. 14 Spiracles of abdominal segments 14 exposed, of 5 7 concealed by preceding tergites. 15 Pygidium (tergite of abdominal segment 7) large, unarmed, convex across and downcurved posteriorly. 16 Sting long strong and powerfully developed. � Leptanilla �������� ����� �� ������ �������, � � ������� �� 2-�. The mesosoma is attached to the gaster by two distinct segments, the petiole and postpetiole. The frontal lobes are always absent so that the bases of the antennae are completely visible where they are inserted into the head when viewed from the front. The pronotum and mesonotum are unfused and with a flexible joint between them. ����� �������� ���������� ����������� �������, ������� ��� ����� ����������� �������� �� ���������� � 3-� ������������� ��������. ������� ������������� �� ����� ���������� ����� ������. �������� ������� ��������������, � �.�. ������������. ����� �����, �.�. ����� ��� ������ � ����� ������������ �� �����������. � ��������� ����� ����� ������ ���������, ������� ����� ������� ���������� ����������� �� ������. ������ ����� ������� ����� �����, ��������� ������� ��������. ��� �������� ����� 40 ���������� ����� (����� 1 ��), ����� �� ������� ������� ������ �� ������ (������ ���������-������), � ������ ����� ������ �� ������ � ������� (������-������) � ������� ��� ����� ���� ����� � ��� �� �����. Leptanilla Emery, 1870: 196. ������� ���: Leptanilla revelierii, �� ���������. Leptanilla � ������� Dorylinae: Emery, 1870: 196 [Dorylidae]; Emery, 1904a: 116. Leptanilla � ������� Myrmicinae: Emery, 1877a: 81 [Myrmicidae]; Emery & Forel, 1879a: 456 [Myrmicidae]; Andre, 1882c: 268 [Myrmicidae]; Dalla Torre, 1893: 72. Leptanilla � ������� Myrmicinae, Myrmicini: Emery, 1895j: 769. Leptanilla � ������� Myrmicinae, Stenammini: Ashmead, 1905b: 383. Leptanilla � ������� Dorylinae, Leptanillini: Emery, 1910b: 32; Wheeler, W.M. 1910g: 138; Forel, 1917: 240; Wheeler, W.M. 1922a: 636. 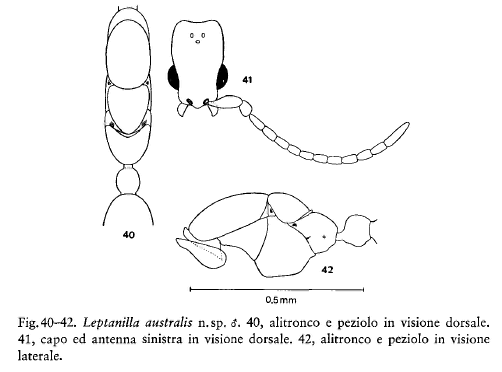 Leptanilla � ������� Leptanillinae, Leptanillini: Wheeler, W.M. 1923f: 335; Wheeler, G.C. 1928: 89; Donisthorpe, 1943f: 656; Baroni Urbani, 1977c: 433; Wheeler, G.C. & Wheeler, J. 1985: 256; Dlussky & Fedoseeva, 1988: 79; Bolton, 1990b: 276; Holldobler & Wilson, 1990: 12; Bolton, 1994: 70; Bolton, 2003: 152. Leptomesites Kutter, 1948: 286. ������� ���: Leptomesites escheri, ������������ ���������. Leptomesites � ������� Leptanillinae: Kutter, 1948: 286; Wheeler, G.C. & Wheeler, J. 1985: 257. Leptomesites ��� ������� ������� ���� Leptanilla: Baroni Urbani, 1977c: 433; all subsequent authors. Phaulomyrma Wheeler, G.C. & Wheeler, E.W. 1930: 193. ������� ���: Phaulomyrma javana, ������������ ���������. �����. Phaulomyrma � ������� Leptanillinae, Leptanillini: Wheeler, G.C. & Wheeler, E.W. 1930: 201; Donisthorpe, 1943f: 683; Dlussky & Fedoseeva, 1988: 79; Bolton, 1990b: 277; Holldobler & Wilson, 1990: 12; Bolton, 1994: 70; Bolton, 2003: 152. Yavnella Kugler, J. 1987: 52. ������� ���: Yavnella argamani, ������������ ���������. �����. Yavnella � ������� Leptanillinae, Leptanillini: Kugler, J. 1987: 52; Bolton, 1990b: 277; Holldobler & Wilson, 1990: 12; Bolton, 1994: 70; Bolton, 2003: 152. Anomalomyrma Taylor, in Bolton, 1990b: 278. ������� ���: Anomalomyrma taylori, ������������ ���������. Anomalomyrma � ������� Leptanillinae, Anomalomyrmini: Bolton, 1990b: 278; Holldobler & Wilson, 1990: 12; Bolton, 1994: 70; Bolton, 2003: 151. Protanilla Taylor, in Bolton, 1990b: 279. ������� ���: Protanilla rafflesi, ������������ ���������. Protanilla � ������� Leptanillinae: Anomalomyrmini: Bolton, 1990b: 279; Holldobler & Wilson, 1990: 12; Kugler, C. 1992: 107; Bolton, 1994: 70; Bolton, 2003: 152. Noonilla Petersen, 1968: 582. ������� ���: Noonilla copiosa, ������������ ���������. �����. Noonilla � ������� Leptanillinae: Petersen, 1968: 582; Baroni Urbani, 1977c: 482; Dlussky & Fedoseeva, 1988: 79. Noonilla ��� incertae sedis � ������� Formicidae: Ogata, Terayama & Masuko, 1995: 33. �� ������� ������������ Leptanillinae �������������� � ������, ���� � ������. ����� ������� ��������� �����, ������, � ����� (7 �����: 3- Protanilla � 4- Leptanilla), ������� � ������ (�� 3-4 ����). Protanilla (�����, �����, ������, ��������, ������). ������ ������ ����� ������� ����� ������������. Emery, C. (1870) Studi mirmecologici. Bullettino della Societa Entomologica Italiana, 2, 193-201. �������� ������� ���� ������� ������������. Ogata, K., M. Terayama and K. Masuko. 1995. The ant genus Leptanilla: discovery of the worker-associated male of L. japonica, and a description of a new species from Taiwan. Systematic Entomology 20: 27-34. Wheeler W.M. 1932. An Australian ''Leptanilla''. "Psyche", 39: 53-58.